3D HDTV may not have had much success with consumers but it did a bit better with consumers. Monitors that display 3D video are nothing new to the world of personal computers but is this technology necessarily a good thing for consumers? This article takes a look at the state of 3D display technology and why it is most likely just a luxury technology for a select few users. 3D graphics are nothing new to the world of personal computers. Games and virtual reality programs have been producing these graphics for over twenty years. It is important to note that 3D graphics represent a three-dimensional world in a rendered two-dimensional display. Viewers of the graphics will get the feeling of depth between objects but the actual perception is not there. It is no different than viewing a standard television program or film that has been shot in two dimensions. The difference is that the user can alter the position of the camera and the computer will alter the view. 3D displays, on the other hand, are designed to try and simulate the actual perception of depth by using stereoscopic vision. This is done by trying to present two different views to each of the viewers' eyes so that the brain will then interpret an actual 3D image as if they were looking at it in real life. The displays themselves are still two dimensional but the brain is interpreting it as being three. The most common form of 3D display is based on shutter technology. This is basically a form of alternating images by the display that is synchronized with some LCD glasses to alternate the two images between the perspective eyes. This technology is far from new and has been used with computers for many years through specialized hardware. The difference is that with fast LCD monitors and shutters, it is possible to produce these images in higher resolutions with greater refresh rates. The latest form of displays doesn't require glasses. Instead, they use a special filter called a parallax barrier that is built into the LCD film. When enabled, this causes light from the LCD to travel differently at various angles. This causes the image to shift slightly between each eye and thus generating the sense of depth without the need to have glasses shifting each eye between two alternating images. The downside is these are generally suited only to small displays. The last technology has been in development for some time and likely will not make it into consumer products for some time. Volumetric displays use a series of lasers or rotating LEDs to present an image in a light that actually fills up a three-dimensional space. There are major limitations to this technology including the need for greater space for the display, lack of color and their high costs. Much work needs to be done on these before they will even make it into much real-world use. 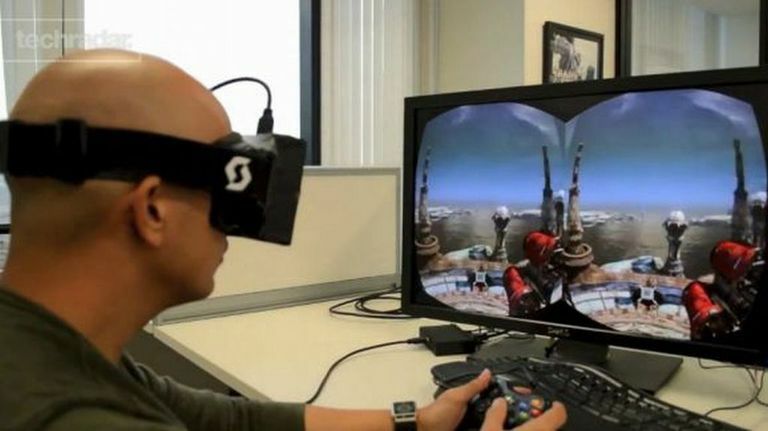 Virtual reality goggles are the biggest trend right now thanks to projects like Oculus Rift and Valve VR. These are not systems that are available yet to consumers as they are still in development but are likely to be released sometime in 2016. They differ from traditional displays because they are worn by the user and there is a separate display for each eye to generate a 3D image. It is highly effective such that it can produce motion sickness and nausea from the lack of feedback. The drawbacks to these are they will likely be extremely expensive and require special software to function properly. The biggest uses for 3D technology are the entertainment and sciences. 3D has already become a popular addition to movies released in theaters. Of course, many of the movie studios see this as a way to drive people to the theater experience rather than the home. In addition, they can charge a bit more potentially increasing their revenues. Computer games have also been produced with 3D graphics for many years. This gives the games a chance to become much more immersive than they have in the past. The other major use is in the sciences. Medical imaging, in particular, will likely benefit from 3D displays. Medical scanners already produce 3D images of the human body for diagnosis. 3D displays allow the technicians reading the scans to get a more complete view of the scans. Another area that can benefit is in engineering. 3D renderings of building and objects can be done to provide engineers a more complete view of a design. Even with all of the various 3D technologies, there is a segment of the population that lacks the physical ability required to see the images properly. For some, this means they will still just see a two-dimensional image while it can induce headaches or disorientation in others. In fact, some manufacturers of the 3D displays are putting warnings on their products to suggest against extended use due to these effects. The next problem is the fact that you will need to have specific hardware in order to use it. In the case of the glasses technology, you have to have a display and a compatible pair of shutter glasses in order to use it. This isn't too much a problem on a single user environment like a computer but is more problematic with a standard TV where multiple users would each need a pair of compatible glasses. The other problem is that glasses for use with one monitor may be inverted from another presenting the wrong image to the wrong eye. Finally, there is the fact that in most cases when interacting with a computer that a user will not need any form of 3D display. Will this technology really be useful when reading an article on the web or working in a spreadsheet. There may be a few cases but the majority of interactions that people have will computers just don't require the technology. While 3D technology may be a big selling point for the home theater environment, the technology still has a very niche segment of the computer world. Beyond gaming and science applications, there is little need for images to be presented in 3D. The extra cost of the compatible hardware over traditional displays will also have many consumers shun the technology. Only once it reaches the cost of traditional displays and more features can be found to use it will consumers really see a benefit. Disclaimer: The author feels it important to let our readers known that he is legally blind in one eye. As a result, he is not physically capable of properly viewing any 3D technology due to a lack of depth perception. He has tried to keep his personal bias out of this article but felt that readers should know this information.